TWO adventurous local women are to climb the highest mountain in England to raise funds for a hearing implant centre in Beaumont Hospital. The two adventurers – Carol O’Neill from Allenwood and Louise McConnell from Newbridge, work at Specsavers in the town, and will embark on the climb on 4 May to raise funds for the National Hearing Implant and Viani Research Centre at Beaumont Hospital, the only facility in the Republic of Ireland that offers cochlear implantation to adults and children with profound hearing loss. The two will join a team of 14 from Beaumont Hospital on the two-day hike up the 987m Scafell Pike in the Lake District. Fundraising is already underway at the Newbridge branch of the opticians with bake sales being held every weekend leading up to the hike. Raffle tickets are currently on sale in store to be in with a chance to win a Easter hamper on Saturday, 20 April. The Newbridge branch will also be making donations from all glasses repairs and hearing aid battery replacements. In addition, the store will donate €1 from each hearing screening in the week leading up to the hike to go towards their €3,000 fundraising goal. 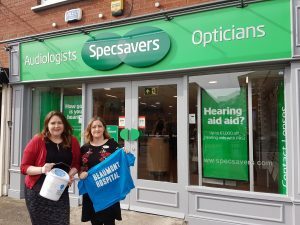 “The team at Specsavers Newbridge are delighted to pledge our continued support for the National Hearing Implant and Viani Research Centre at Beaumont Hospital and we are delighted to be taking part in this challenge,” said audiology director Carol O’Neill. “With one in six Irish adults affected by hearing loss, it is important for us to continue to raise awareness around proactive hearing health in the local community,” she added. The hearing centre at Specsavers Newbridge is open six days a week for screenings and repairs. Complimentary hearing screenings are available to those over the age of 18.